WHEN the phrase “intelligence work” is used to describe the acquisition of foreign military secrets, it is assumed by many to be merely a polite euphemism for spying. That assumption, however, is not altogether justified. Some of the most valuable intelligence work in war and in peace has been accomplished by methods which bear no relation to the ordinary practices of espionage. The amazingly detailed knowledge of German naval movements obtained by the British Admiralty during the greater part of the war of 1914-18 was derived almost entirely from an expert analysis of information furnished by the Germans themselves. As for the ethics of intelligence operations in peace-time, the gathering of news about foreign armaments and martial preparations plays an important, if not an indispensable, part in the general scheme of national defence. For this reason every Power, great or small, keeps a close watch on the militant activities of neighbouring states and, if only as a measure of self-defence, tries to discover exactly what degree of armed strength is at the disposal of those countries which figure on its list of potential enemies. Since uncertainty and suspicion are the parents of fear, a thoroughly efficient intelligence service is in some degree a safeguard against panic and all its evil consequences. Wise statesmen realize the dangers inherent in secret armaments, and therefore strive by means of international agreements to ensure that the great Powers shall communicate to one another the extent of their respective armament programmes. Hitherto these efforts have been only partly successful, but one of the outstanding achievements of the London Naval Conference of 1936 was the drafting of a treaty which binds the signatory Powers to exchange advance information about the number of new warships they are proposing to build and the tonnage, gun-power, and other relevant details of such vessels. This important treaty was signed by Great Britain and the Dominions, the United States and Franco, and it is hoped that all the other important naval Powers may eventually adhere to the agreement. Such a universal compact, by entirely removing the element of secrecy from naval armaments, would unquestionably tend to banish one of the most potent causes of international friction and ill-will. 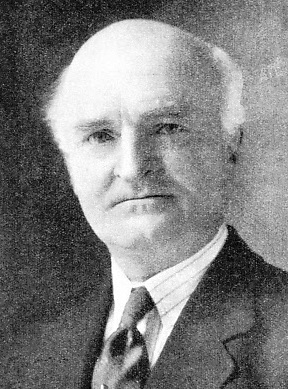 ADMIRAL SIR WILLIAM REGINALD HALL was Director of the Intelligence Division of the Admiralty War Staff during the war of 1914-18. Under his direction and supervision the Intelligence Division was able to forecast the enemy’s naval movements with remarkable accuracy. Sir William Reginald Hall was born on June 28, 1870. In 1911-13 he was Naval Assistant to the Comptroller of the Navy. He commanded at various times H.M. Ships Cornwall, Natal and Queen Mary. He became a Rear-Admiral in 1917 and an Admiral in 1926. By common consent, the most comprehensive and efficient intelligence service known to history was that built up by the British Admiralty in 1914-18 and presided over with consummate ability by Admiral Sir William Reginald Hall. The full story of what that service achieved can never be told, for all the more important facts are filed away in the archives of Whitehall, which are never likely to be exposed to the public gaze. Yet enough is known to make it clear that the Allied victory at sea was in no small measure due to the almost uncanny precision with which the Admiralty Intelligence Division was able to foretell, and therefore to forestall, virtually every naval movement undertaken by the enemy. It is commonly believed that most, if not all, of the naval actions of the war were the result of accidental encounters between the contending fleets. The truth is, however, that every big naval engagement in the North Sea was the direct consequence of dispositions ordered by the British Admiralty on the basis of intelligence reports. The battle of Heligoland Bight on August 28, 1914, is the earliest and most elementary example of this process of cause and effect. During the preceding weeks British submarines, which had been scouting in the Bight, had taken careful note of the system by which the Germans maintained their defensive patrol in those waters. The Admiralty knew, therefore, the approximate strength of the German forces in a given area at a given time, and this information, furnished by British submarines, and supplemented by intercepted radio signals from the German Naval Command, enabled the Admiralty to determine not only the position of the enemy’s main fleet, but also the time it would take that body to reach the outer waters of the Bight. With this knowledge in hand it was comparatively simple to draw up a time-table for the projected offensive operation. Thus, light forces were ordered to be in a certain position at daybreak on August 4, whence they could confidently expect to surprise and roll up at least two lines of German patrol craft. This done, they were to withdraw at a specified time which it was calculated would enable them to get clear away before the first German battleship could reach the scene. Broadly speaking, the plan worked admirably, though defective staff work caused some confusion and nearly led to unfortunate incidents. Even in those early days, when the British intelligence system was still in a rudimentary form, the superiority of its information over that of the enemy gave Great Britain an immense and invaluable advantage. Those words contained little exaggeration of the situation during the last two years of the war. In January 1915 occurred the battle of the Dogger Bank, which had been deliberately staged by the Admiralty on the strength of its intelligence reports. This fact has been revealed by Mr. Winston Churchill, who was then First Lord of the Admiralty. He describes how he was sitting in his room at the Admiralty on the morning of January 23, when Admirals Sir Arthur Wilson and Sir Henry Oliver entered unannounced, obviously charged with portentous news. So it happened that when the German battle cruisers reached the Dogger Bank, believing their presence to be entirely unsuspected, they found Beatty awaiting them in superior force. The battle of Jutland came about in much the same way. On May 30, 1916, the intelligence officers informed the Admiralty that the German Fleet or part of it was preparing to put to sea early on the following morning and would probably make for a position in the North Sea which they were able to indicate. Accordingly, the Admiralty instructed Admirals Jellicoe and Beatty to leave their respective bases at Scapa, in the Orkneys, and Rosyth, in the Firth of Forth, and to effect a junction during the following afternoon in approximately the position for which the German Fleet was believed to be heading. As events fell out the opposing fleets would have missed one another by a narrow margin had not some German destroyers stopped to examine a neutral merchantman. This, however, does not alter the fact that the Admiralty, thanks to its incomparable intelligence service, knew beforehand that strong enemy forces were putting to sea and was therefore able to take steps to intercept them. This was one of the extremely rare occasions on which the German Naval Command was able to mislead the wide-awake British intelligence officers. On the eve of sailing the German Commander-in-Chief, Admiral Scheer, exchanged the radio call sign of his flag-ship with that of the staff-office at Wilhelmshaven. Thus, when the British wireless stations intercepted a message to which this call sign was prefixed, they assumed that the German flagship, and therefore a considerable portion of the German battle fleet, was still in harbour, whereas it was already well out in the North Sea. When they received this intercepted message the Admiralty assumed that only the German battle cruisers w'ould be encountered, and they promptly signalled Admirals Jellicoe and Beatty to that effect. This explains why the sudden appearance of the German battleships took the British Admirals by surprise. Had it been known or even suspected that the German battle cruisers were being closely supported by their main body, there is no doubt that the wide gap between Jellicoe’s battleships and Beatty’s battle cruisers would have been considerably lessened, and that the main action of Jutland would have been fought several hours earlier and possibly with more decisive results. The two factors mainly responsible for the brilliant success of British naval intelligence work in 1914-18 were the German navy’s habit of using wireless as a means of signalling, and the extraordinary skill of the Admiralty cryptographers. Until the last seven or eight months of the war the German Naval Command chatted so freely “on the air” that it was al ways known more or less exactly what they were proposing to do. THE POSITION OF ENEMY WARSHIPS during the war of 1914-18 was accurately determined by a novel and reliable method of wireless directional cross-bearings. 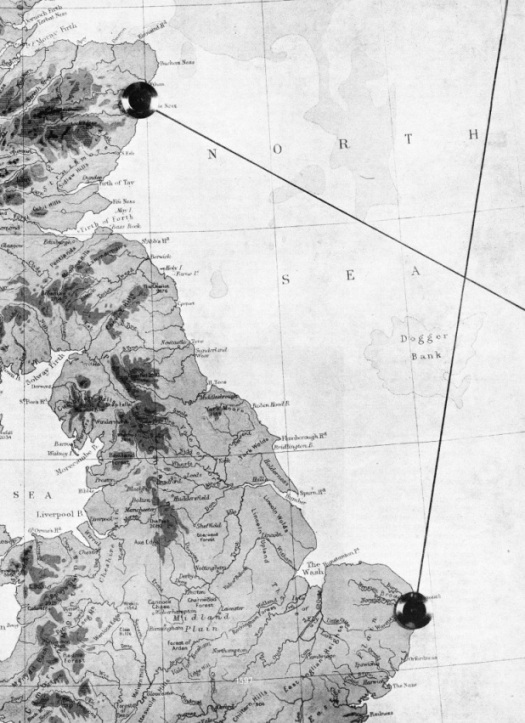 Wireless stations were established at many ports round the coast of Great Britain for the primary purpose of picking up enemy wireless signals. By means of directional wireless such stations could tell from which direction the signals came. This information was immediately sent to the Admiralty in Whitehall. Cross-bearings from separate stations, such as Lowestoft (Suffolk) and Aberdeen would be plotted on a map as shown in the illustration opposite. The point where the lines crossed indicated the position of the enemy vessel. This system enabled the Admiralty to ascertain the position of every German submarine in a given area. These wireless conversations were invariably carried on in code, and latterly the code was frequently changed, sometimes every twenty-four hours. By that time, however, the Admiralty cryptographers had become so expert at their job that the interval between the receipt of a German signal in a hitherto unknown code and its translation into plain English rarely exceeded three hours. During the earlier stages of the war the German naval code was an open book to British naval intelligence officers. This was due to the recovery of a secret code-book from the wreck of the German cruiser Magdeburg, which was sunk in the Baltic in action with a Russian squadron. When the Russians examined the wreck they found this book and promptly transmitted a photostat copy to the British Admiralty. For many months after that German warships continued to use this code, so that every signal intercepted by the listening-stations could be read as easily as if it had been sent in plain language. Even when new codes were adopted the intelligence officers were sometimes fortunate enough to salve a copy of the latest edition from a sunken U-boat. These, however, were purely adventitious aids, and the real secret of the success in decoding the most confidential German messages lay in the skill of the crytographic staff presided over by Professor Sir Alfred Ewing, working in the famous “Room 40” at the Admiralty. As soon as it was found that German naval shore stations were freely communicating with one another and with ships at sea by means of radio, the British Admiralty established directional wireless stations all round the coast to pick up these messages and to determine their source. The method employed was comparatively simple. Say, for example, a German submarine off Beachy Head called up a consort with whom she had a rendezvous. The call would be picked up by three or more of the coastal listening stations, each of which would report to the nearest Base Intelligence Office the message it had heard and the direc tion from which it came. By taking cross-bearings the Base Office would be able to plot the position of the submarine with accuracy, and when this was done, and the position noted on the chart, all shipping in the vicinity would be warned. At the same time destroyers and patrol craft would be ordered out to search for the intruder. Eventually this system of locating enemy submarines from their own wireless signals became so highly developed that at any given time the Admiralty knew exactly how many U-boats were at sea and the approximate position of each one within a zone extend-ing from the Arctic Circle down to the Cape Verde Islands and far out into the Atlantic. This information was of immense value, since it enabled the Admiralty not only to maintain a constant offensive against the undersea raiders, but also to give timely warning to shipping of areas to be avoided. It is no exaggeration to say that millions of tons of shipping were saved and that the submarine menace was finally defeated largely, if not mainly, because of this wonderful system of marine intelligence. To the same agency was due in great part the high rate of mortality prevailing among enemy submarines in the last two years of the war. It was often possible for the intelligence officers to follow the course of a German U-boat leaving or returning to her base as closely as though she had been under visual observation, and therefore to lay an ambush or trap which she could scarcely hope to escape. Though the German submarine captains never knew the means by which this invisible watch was kept on their move-ments, they eventually became conscious of being under perpetual surveillance, and the knowledge can hardly have failed to affect the morale of these officers and their subordinates. naval Power spent a great deal of time and trouble in camouflaging its new construction. Spurious plans of new warships were prepared and palmed off on foreign secret agents, charts of non-existent coast fortifications and minefields were drawn in the minutest detail and with so much circumstantial data that they might, and often did, deceive the expert scrutineers of foreign Admiralties. While an efficient intelligence service is indispensable as a means of noting the warlike preparations of foreign countries, an enormous amount of time and money is wasted by intelligence departments in compiling information which is not only useless but also dangerously misleading. A notorious example of this, for instance, was the famous system of compiling dossiers of all the senior officers of foreign navies, the idea being that such biographical notices enabled the actions and reactions of any officer in the face of given circumstances to be more or less accurately predicted. Unfortunately, those who compiled these dossiers almost invariably omitted some vital characteristic which supplied the key to the temperament of the individual concerned, so that when unusual circumstances did arise the subject more often than not acted in a manner diametrically opposed to the forecast based on his dossier. F urthermore, it was a standing joke in the French and British intelligence circles during the war of 1914-18 that the one German leader of whom no dossier existed in the files was Hindenburg, who, having retired before the outbreak of war, was treated as a back number. 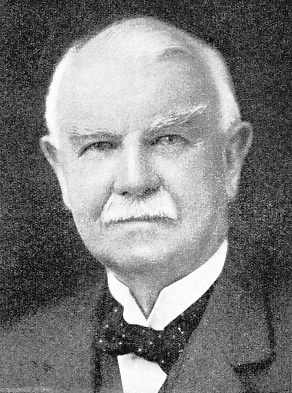 THE LATE SIR JAMES ALFRED EWING, KCB, presided over the cryptographic staff of the Naval intelligence Division for some time during the war of 1914-18. In the famous “Room 40” at the Admiralty enemy codes were deciphered with remarkable rapidity. Sir Alfred Ewing was born at Dundee on March 27, 1855. He was engaged in engineering work until he became Professor of Mechanical Engineering at the Imperial University, Tokyo, a position which he held from 1878 to 1883. He was Director of Naval Education from 1903 to 1916. The justification for all intelligence work was neatly summed up by Napoleon I when he said that the issue of battles and the fate of empires would be determined “if one could only see what is happening on the other side of the hill.” Certain naval and military secrets will always exist, but it is open to doubt whether the money and personal effort expended on intelligence work in time of peace is entirely justified.